Mission: The Office of Military Advocate is charged with advocating for the military services and the preservation of military installations and agencies, as well as defense industries, in Missouri, creating a long-term plan on military sustainability, and helping to fulfill the statutory mission of the Missouri military preparedness and enhancement commission. Function: The Military Advocate will serve as the liaison between state and federal branches of government. 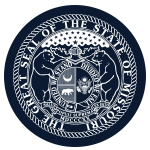 The office also will provide enhanced communication to Missouri government leaders and base communities in order to increase early awareness on base realignment actions and potential downsizing. Compensation: The Military Advocate will receive salary and reimbursement for realized and necessary expenses. Member Requirements: The Military Advocate should have federal work experience, experience with the federal and state legislative process, knowledge of and experience with military base realignment and closure (BRAC) and a thorough knowledge of military branches, organizational structure and operations.